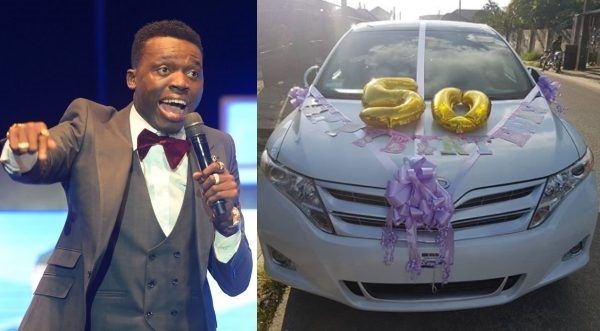 The comedian took to his Instagram page to share a video of how surprised his mum was when he presented her with a car for her 50th birthday. Akpororo wrote, "Little surprise/gift at the church in Warri to my super mum, thanks for believing in me, for your advice and prayers. I pray for more strength, favour, grace, peace, health, wealth to fall on you happy 50th birthday to my number one fan. I love you so much bcos you are the best..."
The car, a white coloured Toyota Venza 2010 edition, was presented to Akpororo's mum in Warri, Delta State. The 50-year-old woman assumed it was a phone when the gift was presented to her inside church premises. In the video, the comedian's mum opened the phone pack only to find the key to a car. If you enjoyed reading this and our other stories, please, share with friends and loved ones.